I’ve been posting blogs on the Security+ exam almost since it was released and this page provides a listing of most of those Security blog links organized by topic. You can also get a listing of all blogs listed in the Security+ category by clicking on the Security+ menu link, or search for blogs with specific keywords using the Search feature. You can also join the conversation on the Get Certified Get Ahead Facebook page. Don’t be examurprised. Read about the new performance based questions in these blogs so that you aren’t surprised by these new exam question types. The online practice test questions now include simulated performance based questions. Over 300 quality practice test questions from the CompTIA Security+: Get Certified Get Ahead: SY0-501 Study Guide. All questions include explanations so you’ll know why the correct answers are correct, and why the incorrect answers are incorrect. Click here for a sample. Performance-Based Questions. Over 30 questions to help you understand and prepare for performance-based questions are included with the full bank of Security+ practice test questions. Help! I Failed Security+ 5 Times. How Can I Pass? Pass the Security+ exam the first time you take it with the CompTIA Security+: Get Certified Get Ahead: SY0-501 Study Guide. You’ll be ready to take and pass the exam the first time you take it. Available in both paperback and Kindle versions. Full Security+ Course and Free Kindle apps are also available. Over 300 realistic practice test questions with in-depth explanations will help you test your comprehension and readiness for the exam. Includes a 75 question pre-test, a 75 question post-test, and practice test questions at the end of every chapter. Supplement your studies with Security+ audio files read directly from the CompTIA Security+ Get Certified Get Ahead SY0-501 book. A total of over 6 hours of audio is now available. Supplement your studies with Security+ audio files you can listen to while on the go. Listen to key topics from all the chapters of the top selling CompTIA Security+: Get Certified Get Ahead: SY0-501 Study Guide, or focus on just the topics you want to brush up on. Note that these audio files are not the entire book which could easily be forty hours of listening time. Instead, they focus on key information to supplement your studies. You can get either the Remember This audio from the book to reaffirm key testable concepts, or the Practice Test Questions and Answers audio which includes full explanations to help you understand why the correct answers are correct, and why the incorrect answers are incorrect. Note: These audio files are from the SY0-501 edition of the Get Certified Get Ahead Security+ book. I’ve been learning from Jack Canfield (of Chicken Soup for the Soul fame) since 2008. Following Jack’s teachings, I’ve enjoyed many successes in my life including starting a career as a writer and authoring or co-authoring more than 40 books that have helped tens of thousands of people get certified and get ahead in their careers. I credit much of my success to applying principles that he teaches in my life. I’m going through his book “The Success Principles: How to Get from Where You Are to Where You Want to Be” again, covering one principle a week. When inspired, I’ll create a post for the principle. Free Kindle applications for just about any device. Practice test questions for your mobile device from LearnZapp. Learn on the go with your phone or tablet. Free practice test questions regularly posted on the Get Certified Get Ahead Facebook page. Learn by listening. Over six hours of audio from the CompTIA Security+: Get Certified Get Ahead: SY0-501 Study Guide. I passed the Security+ 401 exam today with 784!. I do not have any background in IT. I am a senior citizen (55) and I don’t have any other CompTIA certifications. I acquired the certification to help with getting a ministry started at my church that will focus on getting more minorities CompTIA certifiefd. The test was hard and your materials made all the difference. Your advice to set a target date for taking the test. Understand why right answers are right and wrong answers are wrong was spot on. Your materials reflect that you take pride in your work and really care about helping others succeed. I appreciate you tremendously. Thank you. Congratulations on the pass. That’s always great to hear and it’s good to know that the materials and advice helped. I wish you the best of luck with getting your ministry started and all your adventures. Took the security+ test on January 4 passed with 757. This guide was really helpful. Congratulations on the pass. Good to hear that the study guide helped you. Good luck with your next adventure. I just passed my CompTIA Security+ Exam (SYO-501)! I was really sweating it. It is now required for most Department of Defense contract jobs. My current employer gave me 2 months to recertify after I let my SYO-401 lapse. What a mistake. The new one is a bear. A lot of performance based questions. Very detailed in asking for situational lab type questions, like looking at Windows and Linux scripts, then choosing what attack was being performed on a HOST or a Network area. The questions tend to be somewhat hazy. I felt very uncomfortable as I was expecting direct questions such as “What protocol is SSH?” Most questions, I’d say 80% where ALWAYS some scenario relating your understanding of a concept like Encryption; Incident Response; or Attacks and what specific action you would take. –	Make sure you STUDY and understand ALL the Exam OBJECTIVES. Cover EACH and every one. –	Don’t depend on AUDIO study guides. You need to do HARD, college level study prep. –	Know your standard ports cold. Make sure you don’t even have to think twice. These will be secondary on some of the scenarios. –	Have a clear understanding of Protocols; and when and how they are used in Wired and Wireless network. –	Look for study questions that show you scripting samples of attack vectors, types and what to do about it. How would a Sys Admin respond to Cyber incidents? –	MARK and Skip questions you don’t know or not sure. Work consistently toward the end of the 83 or so questions. Some of the questions take multiple passes to understand what they are asking for. So 90 minutes will go FAST. But; make sure you comeback and chose an answer for ALL questions. Don’t leave them blank. Best GUESS if you don’t know. MAKE SURE YOU READ THE FrKnG Questions. Make sure you read ALL the distractors. –	REST before the test. –	The performance questions in Get Ahead helped prepare for the TEST, I recommend that you use multiple sources. CertBlaster and Get Cert Get Ahead in combo with BOTH Study Guides helped. –	DO NOT CRAM or MEMORIZE questions. It will REALLY mess you up. Read, UNDERSTAND, and review the material and especially the SUMMARY chapters before the test. –	For the SYO-501 is best to OVER prepare. Honestly. Good luck all. Hope you the best! I forgot to say say this. I have been a SysAdmin for over 15 years. I took the SYO-401 and passed it in 2013. due to an illness, i let it lapse. I am old (57) but can still remember stuff. I don’t i am dumb. But this test was hard. I passed wtih 775 (passing is 700, i think). So do NOT under-estimate this test. It is $300 bucks. If you buy it directly from CompTIA, you get a discount for a retest. You also get 10% off from most of these Cert Sites. Anyways; again, good luck. Study Hard! Congratulations on the pass. CompTIA just keeps making these exams more difficult. Part of the reason why is that so many people have relied on brain dumps, memorizing questions and answers, and ultimately devaluing the certification. Your advice is perfect for everyone preparing for this exam. Thank you Darryl. I was looking at the CompTIA Exam Objectives for the CompTIA advanced Security Practitioner (CASP). They look VERY similar to the CompTIA Security+. They obviously expand and are more detailed. In your experience; since these are very fresh in mind once you take Sec+; would it be worthwhile chaning the CASP soon after? The test is VERY pricey (USD$439). I don’t see it as a baseline requirement on many job postings as basic CompTIA Security+. What are you thoughts on this? > would it be worthwhile chaning the CASP soon after? Perhaps. However, without knowing you, your knowledge, experience, goals, dreams, or aspirations, it’s difficult to give a meaningful answer. I do recommend you pursue another certification, but you’re the best person to decide what is best for you. You can also search the blogs site for related posts. 2) Enter a search term into the Google Custom Search box. Last, you might like to post your question on an online forum such as the General Certification forum on techexams.net. That will give you the benefit of opinions from a wide assortment of people instead of just one. I just passed SY0-401! Great book! Congratulations on the pass. That’s always great to hear. Thanks for the kind words about the book. I took the SYO-401 today and passed the first attempt with an 818. Your material was invaluable. No IT background. Have been in a 36 week Bootcamp course. Study timeframe – One month. Read book essentially twice. Took ALL tests. I mean all until I could answer them cold to 94-100%. Pre, post assessment, extra question bank, all chapter quizzes. It is not that you should memorize them but you must be able to quickly analyze and answer. Knowing some items quickly will help with your time budget. HIGHLY recommend purchasing the Performance question package and knowing it COLD. Cold up to 100%. As you have stated: Know why the correct answer is correct and why the wrong answers are wrong. Test was 70 questions. Seven were performance based. It was more difficult then I anticipated but was prepared. You must think and you must be prepared to pass this. Thank you. Best wishes to the future test takers. Congratulations on the pass Mark. It sounds like you were laser focused on getting this certification and your efforts paid off. Great study strategies. I want to thank Darril for this amazing site. I wouldn’t have passed the Security+ without the valuable knowledge and practice I soaked up. This site is really top notch from other Security+ sites I’ve been on. Once again thank for all the practice exams, performance exams and encouraging articles on how to prepare for taking this exam. Congratulations on the pass and thanks for the kind words. Ever since making the the excellent investment to use this site, I’ve been very enviously watching others add comments that they passed the exam. Well today is finally the day when I too can add my comment, having passed the exam yesterday, first time too! Absolutely true about doing multiple practise exams and reaching at least 90% each time. Also as Darril wrote, incredibly important to make sure understand the concept of what it being tested. I used the text book as my primary source of study but also other sources to supplement it. I discovered Darril’s app only very late into study and highly recommend it for quick study moments. Congratulations on the pass. That’s always great to hear and good to know that text book and the app helped you. 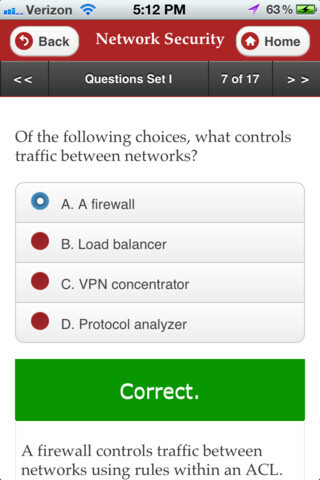 I took CompTIA security+ exam sometimes last week, the first question in the simulated performance-based questions was to configure different firewall rules on the network with TCP/IP source and destination addresses, and ports. The problem I had was that particular page froze and I couldn’t click anything on the page to perform the simulation, but it allowed me to move to other questions. I had to call the front desk for help, they asked me to log out and use another computer, since I still had some time. While I was doing that, the system graded my other answers instantly, and I scored 702/900. Those people told me they were sorry, for they didn’t know it would ended that way. My questions are: Was that a regular thing to expect? Was I supposed to click something differently on that SIM page? What do you suggest I should in such situation please? Your good suggestions would be highly appreciated because I want to retest in the next few days. > My questions are: Was that a regular thing to expect? Freezing questions? Maybe not a regular thing, but a thing that happens. This blog addresses frozen performance-based questions in Tip 4. > Was I supposed to click something differently on that SIM page? “Supposed to”? Not necessarily, but doing what the proctor tells you to do is usually a good practice..
> What do you suggest I should in such situation please? As mentioned in Tip 4, click Reset. I sincerely hope that they aren’t charging you for a retake since you did exactly what the proctor asked you to do. If they are charging you, I recommend you email Pearson Vue detailing what happened and asking for compensation. Good luck on the retest. Thank you so much for you material I passed the first time wit a 779. I strictly used your study guide and just being able to understand why the correct answers were correct and why the wrong answers were wrong was a great strategy. Congratulations on the pass. That’s always great to hear and good to know you followed the strategy I repeat so often. Passed my Sec+ exam today first time with an 842! I agree with many others that the actual exam is quite a bit harder than the practice tests here, but that’s why it’s so important to understand the content in the practice tests and consistently score high. I have been studying for the last 4 months on and off, with a final full-time push over these last two weeks. I took your recommendation and started with the pre-assessment, followed by each chapter. After each chapter exam I went back and studied in-depth any areas that I felt even slightly weak at before moving forward. I took the 75-question ‘are you ready’ test quite a few times, going back after each attempt to re-learn anything I felt I didn’t understand. I would definitely recommend the ‘Extra Questions’ – I found those more realistic to the actual exam. The Performance Based Questions (set 10 in particular) was absolute gold for me, I would have definitely performed worse without having seen and gone through each of those a few times. I also purchased your book as a supplement, which I used to focus on my weak points. I skimmed through it for subject matters I didn’t recognize right away or just plain out didn’t recognize at all, which turned out to help me in the exam on a few questions and also filled in context-knowledge I otherwise didn’t get from my self study efforts or your chapter review notes. As a final thought — I too took the advise to flag and skip the performance based questions I didn’t know ‘immediately’, there were half a dozen or so lumped right at the start. I am glad I did this because I only ended up with about 30 minutes left over by the time I finished answering the multi-choice questions and had to rush a little to get the few remaining performance questions answered while also reviewing the a few others I flagged along the way. Would have definitely had a MUCH harder time passing without this material, THANK YOU. Congratulations. Great to hear you passed and good to know the materials helped. Excellent study regimen to help you master the materials. I would like to thank you first for your advice and secondly for your study materials. I passed the exam on first attempt on monday 28th. I only used your materials to prepare for the exam. To those preparing for the exam. You need to understand the topics covered in the book. Pay attention to “remember this”. I had about 5 – 6 simulation questions (performance based). So again, take your time to prepare and you will pass. Do not trust unauthorized study materials, Darril has the best stuff ever. Congratulations Alain. Great to you passed and and good to know the advice and study materials helped you. Excellent advice to all. Good luck with your next adventure. Congratulations Win. Great score. Thanks for the kind words. Just passed this morning with a score of 808, I am not new to IT because I am currently a junior taking classes for bachelors in Cyber-security. Thanks to your content and 4 day of studying 16 plus hours a day and your premium content I was able to pass first try. I have an associates degree in networking so I promptly will not take the Net+ so I am curious as to were to go from here,and what cert to go after next any advice? I studied daily for 3 weeks, using ALL of your online materials: lessons, reviews, chapter quizzes, audio files, practice exams, acronym list, even the flash cards. The result? I passed my Sec+ exam last week on the first attempt with an 827! I can’t say enough about your material – informative AND easy to read. Much better than my company-sponsored, instructor-led training! little more time and thought. 4) I only knew the answer to maybe 20% of the m-c questions after the initial reading. That’s a very small number and it was very discouraging initially – causing me to panic somewhat. However, after re-reading the question, slowing things down, applying key concepts, and eliminating some choices, I was able to reach the right conclusion many times. 5) Don’t be afraid to back into an answer. I used that approach MANY times because there were *consistently* two choices on each question which clearly did not belong in the mix. 6) Be aware of your time remaining. I needed every single one of the 90 minutes given in order to complete the exam. Congratulations Mark. Great advice to all. Others might like to check out this blog post Skip Performance-Based Questions. It amplifies what Mark says about answering performance-based questions that are clear but skipping the ones that are deeper. Finally…………….after 3 attempts… passed with flying numbers………My problem was that I always ran out of time. But this time I practiced a lot and knew the material very well! Thanks to your website! I have already started studying your network plus Q&A and I am almost ready to take that exam as well! Thank you again! Congratulations on the pass. That’s always great to hear and good to know that the website helped. It’s a tough exam, but kudos for sticking with it until you mastered the material. Good luck with the Network+ exam. Hi, just wanted to say how great this book is. What also helps preparing for the exam is doing test questions over and over. Even though none of the questions on the test are worded exactly like any of the hundreds of practice questions, not only from this book, if you´ve got what´s in this book in your head, these exam questions can be answered correctly. Understand why the correct answers are correct, and why the wrong ones are just that! By the way, I am a 54 year old german national working for the U.S. government in Germany. My current job requires me to certify – and I did it on my first attempt, thanks to this book! I took this exam 2 times since August and failed both times, the SYO- 401. I purchased your book and between that and the getcertifiedgetahead.com practice quizzes I was able to pass today 1/3/2017. I started your book on 12/12/2016. You really have to know why each answer is correct. Much harder than the SYO 201 I took in 2001. I highly recommend your book. Congrats on the pass and kudos for not letting this exam beat you.Great advice to all “You really have to know why each answer is correct.” More, you really have to know why incorrect answers are incorrect. I passed my Security plus today! I got 843 and am very pleased with my score. I want to thank you, Daryl. The study guide is excellent. I ordered the premium content yesterday because I was concerned with the performance questions that is on the exam. I wish I would have ordered sooner but I thought – well if I don’t pass the clock starts ticking on my 60 days now. I studied for about 6-7 weeks. Spent 2 hours nightly and more on weekends. Did take some R&R to the EpCoT Food and wine festival during the process. Full disclosure – I also did the one free week of CBT nuggets this last week. Oh and I’m 54, not taking a meaningful test for 30+ years was a bit stressful. I am so glad that I ordered your premium content because I had 8 performance questions! Can we find out specifically what answers we got wrong? Taking test after test, I like to know where I went wrong. And how is the exam weighted? No worries on the name. People have been ‘correcting’ the spelling for me all my life:). Congrats on the pass. That’s always great to hear and good to know that the study guide and premium content helped you. > Can we find out specifically what answers we got wrong? Absolutely, when you’re using the online premium content. However, CompTIA does not give those details after an exam. Their policies, not mine. > Taking test after test, I like to know where I went wrong. > And how is the exam weighted? CompTIA knows, but they don’t share that information. Good point. I’m very happy to accomplished this. I will highly recommend your book and premium content. Thank you again. I’m so happy to get back my weekends. If you want a career in the IT field, I recommend that you start. Today. I wanted to thank you for all your materials! I passed SYS401 today with 806/900 on my first try! I am currently looking to pursue a career in Computer Security (just starting my 3rd year university), and I had no previous IT background at all making this my first ever certificate. As you mentioned the exam was not easy and most of the questions were very objective oriented but in different format from your questions (I’m sure their testbank is HUGE). But studying your book and doing the questions made me understand the concepts well enough to make the “best” choices which got me the pass! Congratulations Minho. That’s always great to hear and good to know that the book and questions helped you. Just wanted to add my thanks to all those above! I passed today with an 841 and I could not have done it without your study guide and practice tests. School just started this week for me, so I spent all of last week reading 3 chapters a day, reviewing, and taking the practice tests from the Basic package over and over. I reviewed as much as could this week and found the exam to be much more straight-forward than when I took the Network+ exam using other study resources. I wouldn’t recommend cramming the study into a week and a half, but I think it’s just a testament to how well this study guide was prepared. Once again, thanks for the help! Congratulations Matthew. Great to hear you passed and the study guide and practice tests helped. I appreciate the kind words. Today I passed my exam!! Thanks to the grace of God leading me to Darril Gibson. Mr.Gibson knows what he is talking about. (I did also check out Professor Messers free videos as well as his study notes) but the majority of my study came from Gibson’s book and premium content. How I passed: I followed Gibson’s step by step study guide. Although there were one or two days where I did review all previous end of chapters reviews as directed. You turky cannot go wrong. I passed in 30 days!! God bless you. I am looking forward to your response to the message I sent via your contact page. I am very curious as to the steps I should take next. Congratulations on the pass Chienell. Glad to hear that the study guide and premium content helped you. I just passed Security+ exam yesterday, thank you for your book and online materials. Congratulations Pakdee. That’s always great to hear and it’s good to know that the book and online materials helped you. Looking to take this test this Saturday or next depending if I can finish your material. Currently, I’m on chapter 8 and also purchase the premium content from this site. I’ve been taking the readiness test and been scoring 90% but still feel a bit nervous. Wish me luck in passing this test the first time. If you’re taking the online tests using the email you used for this post, I’d strongly suggest next Saturday, not this Saturday. I looked at the scores for that account and see something different than you seem to be remembering. I moved the test from Saturday to today and passed! I wasn’t confident that I would make it, so I decided to go over the materials that I couldn’t grasp. Your book and this site help me a lot!! People listen to this man advice and don’t try to skim by. Also, the tests that showed 4.17% and 37.5% – I didn’t finish them. The last test I took I believe I got 93%. Thank you again. Congratulations on the pass. Good luck with your next adventure. Just passed the Security + exam with a high score, the online training materials were perfect for preparation of the exams. Word of advice to others, is to study all the materials on the site over and over again. Take the practice tests again and again until you’re getting passing scores. Read the Get Certified Get ahead study guide and do the practice exams at the end of each chapters. This site is the way to passing the exam. Study hard and you will have success sooner than later. Thanks Darril, you rock! Congratulations on the pass. Great advice. just passed today the test ! Your book, the online tests within “getcertifiedgetahead” and some “google-help” are what you need to succeed ! Congratulations Francesco. That’s always great to hear and good to know that the book and the online tests helped you. Kudos for doing the research on Google for other questions you had. Passed the test the other day! I hope when people look at this, they realize that they will have to understand the concepts of the questions The way they word them is what i think is throwing people off. PAY ATTENTION TO THE DETAILs and study this website and UPDATED PERFORMANCE questions for sure and you will pass! Congratulations Mike and great advice. Today, I took the Security + exam on my 2nd attempt and I passed!!! Scored an 804. My first try, I did not complete all 72 questions and left at least 10 unanswered. I had a 710 and was determined to pass this exam. After some googling and researching on Reddit, one of the users mentioned you and so I bought the premium content and I must say it really helped me in combination of my other study materials. I studied for another month and I was much more prepared this time thanks to this website. I was spending why too much time on the performance based questions. I did what you suggested and skipped the questions that was going to take a while to answer and made 100% sure I answered all the questions this time. I can breath much better now and will shift my focus on other things. Thank you very much Darril! I will recommend you to anyone studying these exams. The price is very competitive and worth every penny! Congratulations on the pass. That’s always great to hear and good to know that the premium content and blog posts helped you pass. I wish you the best of luck in your next adventure. I just failed today. I passed the 301 version 4 years ago using the 301 edition, and just took the 401 version using the 401 edition to renew my certification. The test was nothing like the book. I’m so disappointed, and my new DOD job requires the certification. Please advise. Sorry to hear you didn’t pass. The exam is tough, but I hear from people almost every day telling me that they’ve passed using the book and/or materials from the gcgapremium.com site. I have no idea what score you received, what your study habits were, how long you studied the 401 edition, or what troubled you on the exam. This blog post might help. Thank you for your quick reply. I read the entire book, practiced the questions at the end of each chapter, the assessment, and practice questions. 1 My score was a 622, and what threw me off were the simulation questions for example, the type of attack, and how to combat the attack. Then last night I read your blogs, and purchased the premium online content for 34.99. I regretted not using this sooner. If I have purchased the premium content at least three days before the test I could of passed, or at least get a higher score than my 622. Will retake this coming Saturday. Wish me luck. Thanks. I think you’ll find that 99 percent of what is on the site is in the book. Much of it is just presented from a different perspective. > and how to combat the attack. As an example, think of a SQL injection attack. It is covered in the book with a couple of SQL commands. There are millions of SQL command combinations but obviously they weren’t all listed in the book. A key phrase was included though: “or 1 = 1.” See that and you should know it’s a SQL injection attack. If you look at a server’s logs and see that phrase, you should know it’s a SQL injection attack. And from the book and online packages (and some blog posts), you should know that the way to combat a SQL injection attack is with input validation. Also, I recommend in the book’s introduction (and in many places on the premium site) to check out these blogs to get up-to-date information and I’ve been blogging about the performance-based questions extensively. One more thing. I’d encourage you to ensure you’re consistently getting passing scores on the Test Your Readiness online quiz before taking the live exam. More, know why the correct answers are correct and why the incorrect answers are incorrect. This way, you’ll be better prepared to correctly interpret the actual questions. I look forward to hearing that you passed. Congratulations Jean. It’s a tough exam and takes a lot to pass. Glad to hear that the Security+ premium content helped you. I have a Security+ question. In your book and APP, you make reference to UTM, unified threat management. A UTM is a security appliance that combines multiple security controls into a single solution. My question, how is a UTM different from say layered security or Defense in Depth ? Are the different or similar in function ? Many thanks for your insight ! They are similar concepts. However, UTM is focused on specific threats while layered security and defense in depth are broad terms. You will often find UTM in the context of a UTM device or UTM appliance. It’s a single device that focuses on threats such as viruses, spam, and malicious code embedded in other traffic such as web pages. Compare this to the physical security for a data center. It would be located well within the building requiring physical attackers to breach several different layers of physical security, such as locked doors, mantraps, video, and guards. Also these different layers would provide defense-in-depth because if one layer fails, other layers will stop the attackers. I wanted to thank you for your excellent study guide for security sy0-301. I had originally planned on taking that exam, but waited too long. So, I needed to study for 401, but found that the 301 still had relevant objectives. I used your older guide, plus a different book for 401. It was my own fault for not buying your updated version. I found your 301 to be very well organized as well as thought out. IS the reason I passed the second time !! No matter how well I knew the material, I wasn’t prepared for the way Comp TIA worded the questions. I studied each of your questions until I knew why each of the right answers were right and the wrong answers were wrong. I noticed that many of the questions from your APP were similar to those from the Comp TIA exam. They may not have been worded exactly the same, but your questions helped me to understand the ones on the exam. If I had not known about your APP or your book with 300 questions, I probably would have failed for a second time. That’s why I wanted to take the time to let you know how excellent your materials are to those who want to be able to pass Security Plus or any other of the COMP TIA certification exams. I have been in IT for several years and I found the exam to be ugly. Congratulations on the pass and for not letting the initial set back stop you. Thanks for the kind words. It’s always great hearing when the resources have helped someone pass. I read the book and used the full site access (including listening to all MP3s in my car) for review in about 3 weeks. Just took and passed the test (848) this morning. I did have 5 performance based questions at the very beginning which took the most time (and I ended up reviewing at the end), so that put me off a little bit, but not too much. I did review the subnetting section before the test as well as a review of that for me is always good, but there were no questions (for me) that ended up using it. Congratulations Charles. It’s a tough test, but glad to hear you passed and all the resources helped you. I passed my Security+ last Friday. Darril, your book and blogs are very useful and helpful. Thanks! Congratulations Harry. That’s always great to hear and good to know that the book and blogs helped you. Good luck with your next adventure. In chapter 2 performance-based scenario you have put the mantrap for the server room along with the proximity card reader. for the office you put a fingerprint reader and a proximity card reader which will provide multi-factor authentication. I think the multi-factor authentication should have been implemented for the server room to provide more security, and the mantrap for the office as single factor authentication would be sufficient. if possible email me with the clarification if possible. I see you’re talking about the sample question in chapter 2 of the CompTIA Security+: Get Certified Get Ahead: SY0-401 Study Guide. First, authentication occurs when an individual claims an identity (such as with a username) and proves the identity (such as with a password). The physical security controls in this scenario provide additional physical security, but not necessarily authentication. In other words, justifying the placement of the physical security controls based on authentication instead of physical security will lead you astray. A typical mantrap does not provide reliable authentication. Mantraps are typically activated with a proximity card, which can be shared between people. In other words, one person can take someone else’s card and use it to gain access. A sophisticated mantrap can be activated with a proximity card that also requires a PIN unique to the card and the user. This provides multi-factor authentication (something you have and something you know). However, the primary purpose of a mantrap is to prevent tailgating, not authentication. There are two logical issues here too. First, you have four fingerprint readers and three are used on laptops. Without any other words about these, it’s logical to think that the four fingerprint readers are the same so the fourth would be used on a computer, not to control access to a room. Transforming the fourth reader into something different than the other three indicates you may be overthinking it. Second, where is tailgating most likely an issue? You’re on the right track thinking that the server room requires stronger security. The mantrap increases security for the server room by preventing tailgating. I have passed the exam with score of 887 , I think I missed a question which was phrased in a weird way. I used the book, mobile app and the blog and they were really helpful. I came back to this comment because I got similar question where there was one biometric reader left and no way to put it anywhere rather than to secure the data center ( I don’t want to go deep as I have to adhere to the NDA ^^). Thanks again for your valuable book and app and I am planning to take the SSCP exam after a year of experience following your book and guidelines. Congratulations on the pass. That’s a great score. The purpose of the sample performance-based question is to get people to understand the content, not to mimic an actual question. It seems like it worked for you based on your score. So glad to hear the book and app helped. Thanks for the great content on your website and your Premium Content. I passed with just 1 week of preparation and 1 day on your Premium Content. Read your Study Guide and did the Practice Questions and that really helped me prepare for the test. I scored 855/900. Note: There were questions about Self Encrypting Disks (SED) on the test, and I did not come across that in Study Guide or Premium Content, if you want add that in future versions. Thanks again for all the great materials! Congratulations Mehul. That’s always great to hear and good to know that the Study Guide and the Premium Content helped you. Thanks for the tip on SED. You book Get Certified Get Ahead helped tremendously I passed today with an 837 – SY0-401. Congratulations. That’s always great to hear, and good to know the book helped you. Good luck with your next adventure. Just wanted to say that I used your study resources almost exclusively and passed the Sec+ with and 837! The book was great, and the app was a great supplement. Thanks a lot Darril! Congratulations Julian. That’s always great to hear and good to know the book and the app helped you. Good luck with your next adventure. Thanks Darril for providing an awesome study aid!!! I stumbled upon your website 5 days before my exam was scheduled and suspected I had found gold. The practice performance questions were great, but your explanations in the test bank of questions was exactly what I needed to clear up any FUZZING that was going on in my head. Any chance you’ll be coming out with a book and/or online study material for the CISSP? If so, I’ll gladly pay for both. Congrats on the pass Matthew. That’s always great to hear and good to know that the explanations in the test bank helped you pass. Me and two talented trainers and authors have been updating the CISSP Certified Information Systems Security Professional Study Guide to the next edition and it’s due out in September. The current edition is available now. Due to a clause in the contract, it’ll probably be difficult to create additional study materials for the CISSP so I don’t see myself doing so. This is the only book I used for preparing Security+ certification. I am new to security field. I am working as Web Application Software QA Engineer. I had little experience in Network or Security. Started with the assessment exam from the book and got 31 % (on March 18th, 2015), started studying this book, the book is awesome, its well written, easy to understand and follow. I really understood the concepts. Read the book twice. Took the assessment exam again (on May 2nd, 2015) and this time i got 94 %. Signed up for the certificate exam. Purchased Security+ Study Package 30 day online access, this is super useful, because of the flashcards, and simulated performance-based question. I took Security+ certificate exam today (on May 15th, 2015) and I passed the exam with the score of 841 out of 900. I got 69 questions in my exam and out of 69 questions, 5 were performance based questions and all the 5 performance based questions were easy, because I practiced for performance based question from http://gcgapremium.com But the multiple choice questions were beast. I was sure that I am answering right for few multiple choice questions, but many questions, i was able to easily reject 2 choices, but picking the GREAST / BEST / MOST correct answer out the 2 were not that easy. The knowledge i gained from reading the book helped me pick the right answer, I am so happy I got my certification. Thanks a lot Mr. Gibson! for the book and the flash cards and simulated performance-based question in http://gcgapremium.com !!! They all helped me immensely. Awesome KD! So glad to hear that the book and online resources helped you pass this exam the first time you took it. Great score. I took the exam yesterday and passed with a score of 835! I used the Security + SY0-401 Study Guide. I purchased the premium content to practice the performance based questions (I highly recommend this). I also purchased the app for the iphone/ipad (very useful). It took me three weeks to complete the book (I took my time because I wanted to learn the material). I then took 1 week taking exams and reviewing material. My tip: “Spend plenty of time learning, understanding, researching, and playing with the technology. I didn’t worry about the questions on the exam because I understood the concepts. Thanks Darril for a wonderful study guide. I look forward to your Network + study guide as well. Cheers! Congratulations on the pass Andre! That’s always great to hear and good to know that the Security+ SY0-401 Study Guide. helped you pass. Mr. Derril’s Security+ SY0-401 Study Guide book simply works. I followed the exact guidelines in this book to prepare for this test and passed with a 802 score today. I gave myself enough time to study (~45days) , read the book twice and did 2 practice exam twice. This book is very well written with thorough explanations about each subject, very easy to follow. I found the other book that I read was like trying to overwhelm the readers with a lot of material without clear explanations. Bottom line is I gave up on this other book and just focus on reading Mr. Derril’s book the entire time. Also, I had no prior network security experience before hands. Congratulations on the pass Andrew! And thanks for the kind words about the Security+ SY0-401 Study Guide. So glad to hear it helped you pass. Hello, after seeing all of the good reviews on your resources, I am purchasing your book. Unfortunately I failed the test the first go around, I scored 643 which comes out to be about 71% I believe. Now that I will buy and use your study guide, I feel that I will pass the test. I will let you know how it goes. Good luck McKinnely. You’re close and I’m sure you can do this. I look forward to hearing from you when you pass. I was wondering where on your site I can locate errors in your current Security + 401 book. SWorry, I forget the term for what I am looking for. I know question question 8 in chapter 2 is wrong. LOL At least the letter next to it is. WOW…. Just passed SY0-401 today, largely in part to this book! Two months ago, I took the exam and failed. Using a different book and online materials, I had studied for two months, 4+ hours a day, and the night before…I went through EVERY bullet on the exam objectives. I knew the material, but I was not prepared for the format of this test. This study guide did an AMAZING job of preparing me for the exam. When I started reading it, I IMMEDIATELY knew why I missed certain questions. The way Darril breaks things down with practical and metaphorical examples really helps you build a solid understanding these concepts. Not only that, but more importantly…he talks about HOW the test is structured and his practice quizzes are more in line with how the SY0-401 exam asks you questions. If you are an IT newbie, I would suggest acquiring Network+ before considering this exam. If you are like me, an IT professional with limited security training/experience, then this book is your best friend. I’d recommend the practice questions/answers on the Kindle too. I’ve used every online resource, a different book, and even CompTIA’s own CertMetrics. This book was the best at preparing me. I failed the test the first time by 20 stinkin’ points. I breezed through the exam today with an 814! Thank you Mr. Gibson! I WISH that I had purchased your book first! Congratulations Jason. Great post and great score. I’m so glad that you didn’t let the first experience with this exam stop you and you persevered to take and pass the exam. Thanks for the post and the kind words. Thank you for such a well structured book. The content was interesting and emphasizes everything needed to know to pass the Security+ exam. Passed today with an 860. Received my Network+ and Seucrity+ cert within 3.5 months using your material and no prior tech knowledge in Network/Security. Thanks again. Congratulations on the pass Wesley. 860 is a great score, especially with you level of experience. Thanks for the kind words about the book and good luck with your next adventure. I bought your book about a month a half ago. With no prior knowledge or experience in networking, I didn’t know if I can make it (UDP, SSH, SSL and about 90% of the terms were new to me). today I took the exam – I passed! the book is well written and the audio files are very helpful. Awesome news! Congratulations and thanks for sharing it with me. I’m very grateful that I’m able to help so many people pass this certification the first time they take it. How are you? My name is Laueen. I just missed the old 2014 Security plus exam. I bought your book already (CompTIA Security+: Get Certified Get Ahead: SY0-301 Study Guide). Is this book still useful for the SYo -401 test? I heard that a lot has changed on the SYo – 401 test, do you know what the changes are and how I can be better prepared to take the exam? Hi Laureen. Sorry to hear you missed the deadline of 31 Dec 2014 to take the exam. It is still live in some non-English countries but I’m betting that doesn’t apply to you. You heard correctly. There are many differences between the 301 and the 401 exams. You can view them all in a series of blogs starting here. It’s best to use a book written for the exam you’re going to take. Many people have let me know that they passed the 401 exam the first time they took using the CompTIA Security+: Get Certified Get Ahead: SY0-401 Study Guide. You can get a free excerpt (the intro and Chapter 1) by signing up for the Get Certified Get Ahead newsletter. Also many study resources such as flashcards, audio, practice test questions, and simulated performance-based questions are available on the premium site. Hope this helps. I wish you the best of luck. Passed the security+ sy0-401 exam today with an 814 after my third attempt! I just purchased your study materials last week and they helped me out the most. Your online practice questions thoroughly covered everything I needed to know. I have even tried comptia official cert master and purchased other books to study that did not help anywhere near as much as your material. Thank you! Have taken and failed Security+ test twice, scoring a 729 both times. Just purchased your study materials and am hoping to pass on my 3rd try next week. Good luck Josh. Not sure which exam you’re pursuing, but you only have one more day to take and pass the SY0-301 exam. You can’t take it after midnight December 31. The SY0-401 exam is the newer exam and will remain available for a few more years. The good news is that you’re close with a score of 729. With just a little more understanding, you should be able to pass it. Congratulations Brian. It’s always great to hear about successes and I’m grateful these resources have helped so many people like you pass the first time. Enjoy the holidays. Darril, just wanted to let you know I passed the SYO-301 today with a score of 862! My study tools were your book and premium website, which I can’t recommend highly enough to anyone who wants to pass the first time. Thanks again! Thanks for your help, Darril!! I passed SYO-301 today with a score of 852 using your content. I did have another online class for study which provided a foundation, but your content filled in gaps and provided both information and insight that the online provider missed. Had I relied only on this very well known online provider, the exam would have been a lot more daunting. Also, I must confess, I was very skeptical of your premium content and wasn’t going to use it but when I had a difficult time finding more detailed info on the performance based questions, and with so much money on the line and very little time, I thought “What the heck?” Today, I’m very glad I did. The premium stuff was “da bomb”. I used the Kindle version of your book and was able to go over concepts just by whipping out my phone. Very convenient. Your content was far more helpful, easier to understand and relevant than my E#@mC$@m text. I can honestly say Darril Gibson pushed me over the top. Congratulations JT. Great score and good to know the material helped you pass this exam the first time you took it! Thanks for the kind words. Good luck with your next adventure. Congratulations Denis. Great score! And good to know the book and membership material helped you pass. Good luck with the CEH. I just passed my Security + certification exam this afternoon due to your book for SYO-401 Security + along with the premium access to the website. I gave myself about a month after i had a week long class for the certification. But i think it might have been the book and website that really helped me pass the exam. Your book helped me earn an 793, i was aim for something in the 800s i ‘ll take a 793. I had about 6 performance based questions that were similar to one ones from the website and the blogs and about 70 form-based questions to complete . Some of simulations were configuring a wap, security controls for data center and mobile devices, configure a firewall, etc. All in all, I’m pretty proud of myself today i just calmed down and breathed before i took the test. I double check my answer to make to make sure that i picked the appropriate answer for the question. Awesome news Teresa. Congratulations! It’s always great to hear news like this and good to hear that the book and other resources helped you. Just wanted to say thank you! Your book helped me earn a 869 on the SYO-301 Security + exam today! I had 5 performance based questions similar to the ones in this blog and a total of 74 questions. Congratulations Lenny. That’s a great score and good to hear that the resources helped you. Good luck with your next adventure. I just passed the SY0-301 with an 841. GCGH was my main studying resource for the exam. Thanks alot! Congratulations Washington. 841 is another great score. Glad to hear that these resources helped you. Good luck with your next adventure. I took the SYO-301 exam today and passed with a 798 which I am very proud of given the fact that I have absolutely no IT knowledge and work in a different field at the moment. I started reading your book exactly a month ago then purchased your practice test 2 days ago which really helped me test my knowledge. The exam had 5 performance based questions that were very close to the examples you provided. I would recommend your book to anyone that is preparing for this exam. Thank you! Contrats on the pass Tricia. That’s always great news. Glad to hear the book and resources helped you. You did a great job writing this book, very easy to read and comprehend. I prepared for the Security+ exam using this book as my only source. And I passed with a great score. I’ll start preparing for SSCP soon, using the book you’ve written for that exam. Thanks again for putting your knowledge in writing and sharing it. Congrats on the pass and thanks for the kind words. Good luck with the SSCP. Thanks again for your great book. I P@$$3d the SSCP exam. Congrats on another pass, and only about a month after the Security+ pass. Good luck with your next adventure. Hi Darril, is there a down-side to taking the SYS-301 exam now even though it expires at the end of 2014? Does that mean that my credential will also expire at the end of 2014 as well, or do I get three year credential before I have to take the 401 exam? Thanks for your advice. No, there’s no down-side to taking the SY0-301 exam. Whichever exam you take makes you Security+ certified for the next three years. Also, hiring managers don’t care which exam you took, only that you are Security+ certified. That’s good news, thanks a lot Darril! Your book was outstanding, I have been tinkering with computers and networks since before 286’s as a hobbie. In the last 8 years I have been able to turn that hobbie into a career. The last four years I have worked for a large company as a field tech. I had to make a job change and my new company required me to have my security + cert and have it quickly! I read and passed the test in a weeks time and I could not have done it with out your book. As a matter of fact I didn’t finish the last two chapters but went through all the practice test. I didn’t score extremely high but enough to pass. Thank you for publishing this book. No worries I will go back and retread the entire book again. I will be using your study guides for future certs. Congratulations Tim. Not many people can study the book and pass after a week, but glad you could and did. Good luck with the new job. sscp is it easier than comptia secutity + 301 ? The SSCP is not easier than the Security+. You really need to understand the content in depth. However, your level of knowledge might be in depth so you already have a lot of the knowledge after recently studying for and passing the Security+ exam. Just passed the SYO-301 today with a 820. I listened to Darril Gibsons MP3 and read his book. I realized I had a week left before my A+, Network+ and Security+ expired so I crammed for a week. I know I shouldn’t have waited so long but I must have listened to the MP3’s a million times. Again thanks for the material. It’s always great to hear about a pass, and I’m glad the resources helped you. Hi Darril, when can we see a new book for SYO 401 ? I’m frequently asked if I’ll be writing a 401 version of the CompTIA Security+ Get Certified Get Ahead Study Guide. The answer is Yes. However, I don’t know the timeline right now. I’m in the middle of two large projects and when they are done, I’ll shift my attention to the SY0-401 version of the CompTIA Security+ Get Certified Get Ahead Study Guide. I will announce progress in the Get Certified Get Ahead newsletter so if you’re interested, I encourage you to subscribe to it here: http://eepurl.com/I8Vlz. However, if you want to get the certification, I strongly encourage you to go for the 301 version. No need to wait. Congratulations Alfousseine. It’s always great to hear about someone passing the exam using one of my books or resources and I really appreciate your kind words, and the 5-star review. Good luck with the CASP, SSCP, and CISSP. Congratulations on the pass Rhishabh. That’s always great news to hear and I appreciate the kind words about the resources. I was referred to your book on Security+ “Get certified get ahead”, and I have quick question. Do you believe that using your book only will suffice for the security+ exam? this is from a perspective of someone who is an IT Technician. Perhaps. But don’t take my word for it. Take a look at the Amazon reviews (http://ow.ly/w8uqh). You’ll find that many people used it as their sole source, while many others used it along with LearnZapp apps, reading blog articles, and Security+ study packages from http://gcgapremium.com/. Other people supplemented their studies with materials from other sources. In general, a single source is rarely recommended for any certification though. This is regarding how to prepare for the for the CompTIA Security+ exam. Recently i have purchased CompTIA Security+: Get Certified Get Ahead: SY0-301 Study Guide from Amazon.I am preparing for the exam. I have verified on page 2 ” how to use this book session”, it was mentioned as below. Review the objectives and learn the materiel related to this objective”. Do i need to concentrate on Chapter vise..like Chapter 1, chapter 2 and then relate it to the objective to the Chapter map. The short answer is to use it the way it works best for you. The book has the extra tools like the the objective to chapter map so that people with different learning styles can use it differently. Many people read the book from page 1 to the last page and this works. The chapters build on each other making this easier for many people. However, if you have much of the knowledge, you might just browse the objectives to identify what isn’t familiar and study those topics. I took my Security+ exam yesterday and passed with an 805. This was from reading your book along with the practice tests and simulations found on the getcertifiedgetahead website. I am not a Security Professional but an Application Developer that needed the certification as a job requirement. Thanks for the website and book. Congratulations on the pass Karen. That’s always great news to hear and glad to hear the book and other resources helped. Good luck with your next adventure. I’m appreciate your work to bring us a valuable book. I used your book (Security+ Get Certified Get Ahead SYO-301 Study Guide) only and passed my exam at 852. I just want to say thank you. I would suggest your book to my friends. I’m planning to have CEH in next several months. Is that a good track? Congratulations on the pass Zack. 852 is a great score. Good to hear that the book helped you and recommendations to your friends is always appreciated. I’m not close to the CEH certifications so can’t say much about it. Many people do like it though. Hello, I just passed my Security + exam today with a 869. Thank you so much for your great book which was essentially my sole prep material (along your blog posts). Thanks to your posts on the performance-based questions they were not a surprise to me and I did not find them terribly difficult. Your book has go to be one of the most readable IT-related books I’ve ever read. Topics were covered adequately (but not beaten to death) and the little bits of humor thrown in were a welcome addition. CEH is next on my list. Oh… btw the ‘Contact Darril’ and ‘About Darril’ links at the top of the page are not working as of this post. Congratulations Matt and thanks for the kind words about the book. That’s a great score and it’s always good to hear one of my resources have helped others. Thanks for the feedback on the Contact Darril and About Darril links. I appreciate it and fixed it as soon as you mentioned it. I just wanted to say a very big thank you for the work you’re doing helping students like me pass their Security+ certification test. I passed with 858/900 by solely using your study guide, 400+ practice test, and not forgetting the performance based questions. I allude this to the simplistic way facts and principles are presented in your book. The test had 5 performance based questions; in fact, your perf based questions presented themselves in the test. I also thank you for being part of the student’s community via twitter, linkedin, and other platforms. This too was very helpful to me as I followed and attempted to answer every question posted on these platforms. Thanks once again and God bless you. Congratulations Felix. Great score. It’s always good to hear that these resources are helping people take and pass the exam the first time they take it. Good luck with your next adventure. Just wanted to say thank you for creating this Security+ Study Guide. It helped me pass my exam first try, scoring an 867. This is the ONLY book anyone should need to obtain to pass the current Security+ exam. Although I have a background in network security, which helped me absorb the concepts and terminology quickly, I know after reading your guide that all the information is there to pass the exam first try if the book is studied cover to cover. I did not personally attempt to take the exam quickly, but studied the book over a couple of months, and the result was a first try pass. Also, thank you for being so involved with your community. Reading posts and comments helped my confidence that your study guide was the right choice. Good luck on your next edition! Congratulations Jeff and so great to hear that the book helped you. That’s one of my primary goals – helping people pass the exam the first time they take it and it sounds like taking the time to soak in the material worked perfectly for you. 867 is a great score. Good luck with your next adventure. I sat for my Security+ exam yesterday and passed. Darril, I relied solely on your book â€œSecurity+ Get Certified Get Ahead SYO-301 Study Guideâ€, the practice test questions, MP3 audio (hours of listening) and the performance based questions. The performance based questions (Five) and the Ports were exactly as you presented them. I am glad, i did not have to spend a whole lot of money, but your book was all it took to pass the exam. Thanks for all you do. Best wishes. Congratulations on the pass, Michael, and thanks for the kind words. this book works!!!! i read this from front to cover. the simulations really sucked though. I wanted to thank you for your valuable study resources. By purchasing “Security+ Get Certified Get Ahead SYO-301 Study Guide”, and the accompanying Android app from the play store, I was able to get my Security+ certification a few days ago. I enjoyed the book read greatly, and the quick references/tests from the app were top-notch! They were well worth the small amount it cost to buy them. Thanks again, and best wishes. Congrats on the pass and thanks for the kind words. I wish you the best of luck in in your next adventure.